CLICK HERE... to see the special people who are involved through sponsorship and donations. Everyone is all excited and geared up for our upcoming Home Make-Over in September. We are well in the process of securing sponsors and volunteers for this event but everything looks positive and we continue to trust God for His provision. In the month of July we were privileged to have a group of youngsters from New Orleans who visited us under the leadership of Arno Plaisier from Beautiful Gates Ministries. 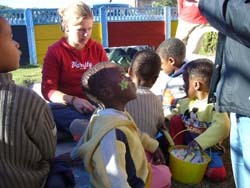 They entertained the children with face painting, balloons and bubble machines much to the delight of the children. What a great bunch of young people with a heart to take time to visit those less privileged. Intro to Health and Safety (1 hr). 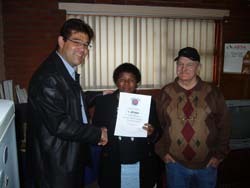 The course was well attended by the staff and graduated with certificates at the end of the session. 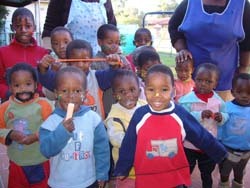 The Volunteer group took care of the children while the ladies were on the course. The training was sponsored by Mr. Tommy Gordon from REFLEX FIRE & SAFETY (phone no. 021-5521706 / fax no. 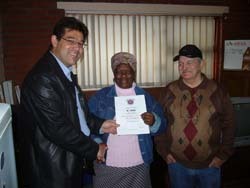 021-5521708 / mobile 0720643156) and he has pledged to continue offering these courses and others on a regular basis as his way of giving back to the community. Our next course is scheduled for August 2007. One of the twins, Andiphiwe Mpiti has finally had her colostomy removed after a lengthy operation at the Tygerberg Hospital. She is recovering as we speak. We are expecting her home any day now.